About this retreat . . . Put your day-to-day life on pause to immerse yourself in a retreat to Blue Spirit, one of Costa Rica's most beautiful natural settings. Blue Spirit is perched on a peninsula overlooking the Pacific ocean and a three-mile white beach protected as a turtle refuge. Extraordinarily beautiful and built on sacred ground, Blue Spirit is dedicated to health and spiritual transformation. Blue Zone- “A geological area where more people live beyond the age of 100 than anywhere else in the world.” The Nosara peninsula where Blue Spirit is located, is one of the world’s largest Blue Zones. It is ranked 3rd on the World Happiness Score compared to the U.S. at 150. 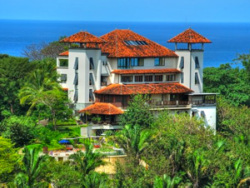 Blue Spirit is a world-class Yoga and Meditation Center. This retreat is suitable for all levels of yoga including experienced yogis and those new to yoga. Everyone can experience increased health, vitality, and yoga bliss. Accommodations and three delicious meals per day. Beautiful beach, tranquil infinity pool, and exceptional weather in November. Twice-daily yoga for all levels including gentle, dynamic, beach yoga, meditation-in-motion, yoga dance, yoga therapy, group & partner yoga, restorative, and yoga nidra. A different meditation practice each day for both new and experienced meditators. Daily programs of sacred practice and communion with nature. Free time every day to relax in the enchanting grounds or explore Costa Rica as you wish. Optional evening programs including Latin Dance Class, Fire Celebration on the beach, and Evening Salon for deeper connections and fun. Healing Arts are extensive and encouraged for deep restoration and healing. In addition, Blue Spirit offers surf lessons, horseback riding on the beach, zip-line excursions, jungle adventures, visit to Howler Monkey sanctuary, tours, and other activities not included in the retreat. 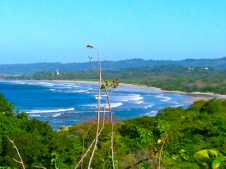 Click here for more info on Costa Rica excursions. Blue Spirit offers a variety of accommodations for varying tastes and budgets, from luxury rooms with ocean or mountain views, to charming nature suites and platform tents. There are a limited number of rooms at each level of cost. All rooms are offered on a first come, first served basis. ** Review the room selection below, click on the name of the room to view it, and contact Sharon at sharon.hillsbonczyk@gmail.com or 612-709-4089 to reserve a room and register for the retreat. The following prices are all-inclusive, covering the entire retreat. A $300 nonrefundable deposit will hold a spot for you. PLEASE NOTE: The following prices are Earlybird Special Rates. After July 1, add $150 to the cost of each room. Sharon Hills-Bonczyk, MPH, RYT-500, is a transformational Kripalu yoga teacher and Ayurvedic educator. She offers classes and workshops at The Marsh in Minnetonka, Minnesota, teaches at Normandale College, and is the founder of 5809 YOGA, a home studio in SW Minneapolis. Sharon has a passion for leading pilgrimages to sacred sites. Her work is inspired by yogic wisdom, 20 years as a leader in healthcare innovation, and her own personal journey of healing. Lynda Griebenow, M.S., is a transpersonal psychotherapist with a private counseling and consulting practice in Minneapolis, Minnesota. She is a certified practitioner of Grof Holotropic Breathwork™ and SoulCollage® with a passion for experiential learning that supports the full expression of individual potential. For more than 20 years, Lynda has facilitated trainings, workshops and retreats in India, Europe and throughout the U.S.
Summer Joy Hills-Bonczyk, MFA, RYT-200, is a visual and performance artist, dancer and devoted yogi. 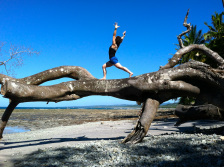 She leads international retreats that integrate art and yoga, is a Spanish medical interpreter, independent artist, and Journey Dance™ facilitator. Steve Bonczyk, B.S., RYT-200, is a certified Kripalu yoga teacher and a long-time airline employee who cured his chronic back issues with yoga. A beloved member of his yoga-teacher family, Steve provides assists during classes and coordinates logistics for the retreat. Click HERE for detailed information about the trip.